My husband and I camped on St. John in the US Virgin Islands for years and years and fell in love with the place. We found a hurricane-damaged house in 2000 that was listed for very little money, and bought it! We then rebuilt the place by ourselves, with a bit of help from plumbers, electricians, painters and other friends that flew down to join the fun. We rent it out by the week, and get down there several times a year ourselves to enjoy the sun, warmth, hummingbirds, snorkeling, wild donkeys, rum drinks, conch fritters, and so on! 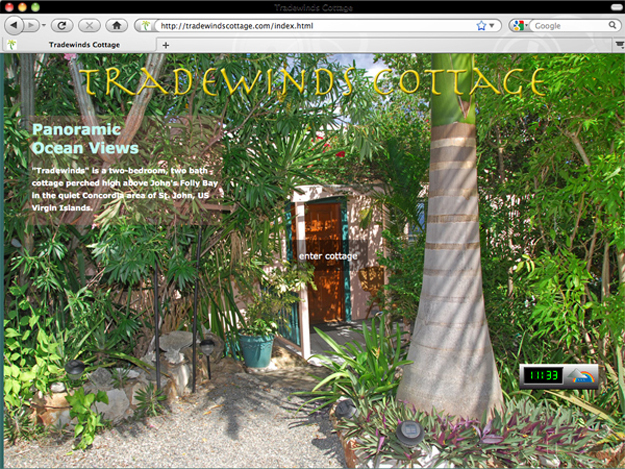 I wanted a website that showed the great views from every window, so did large photos with the ability to “walk around” in the cottage by clicking on doors and entering the next room. Check it out here.